When you’re talking about anything related to the always-flamboyant Lady Gaga, you surely know that it’s going something to be over the top as usual, and rightfully so, Best Buy is offering a special promotion in conjunction with the launch of her upcoming CD. 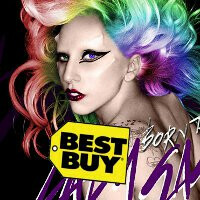 Whether you’re a fan or not, customers who happen to purchase any postpaid mobile phone from the big box retailer between May 22 and 28 will be given free copies of Lady Gaga’s “Born This Way” CD. Furthermore, they’re selling the Samsung Epic 4G, HTC Inspire 4G, and Samsung Fascinate for the super impressive price of free with a contract – plus, those purchasing any of those devices will get a digital version of the album as well. Still, you can’t help deny the impressive pricing that Best Buy will be offering for the trio during this special promotion. Not only will you be able to take joy in your new smartphone, but you’ll even have the prestigious opportunity of checking out the eclectic ballads that Lady Gaga is known to embody. so they give the verizon people the shaft and offer good phones for the other carriers and a pile of junk to the people who choose verizon.. interesting. Best Buy doesn't sell the Droid 2 or the Droid Pro. But it would have been pretty sweet to see the Droid X on that line up. That very well may be true, but she's damn good at putting on a show. She has a great voice and she got places despite her ugliness. Maybe there's hope for YOU after all. not a big fan of gaga's but she is incredible at marketing herself. that pic makes her look like maryln manson dipped in rainbow sherbert though. Thats awesome Best Buy!! !1 GAGA IS AMAZING!!! Everyone can hate because they will never become like gaga or ever have the success she has. I do hate the phones they are offering. I'm waiting on the htc sensation!! !